Hair loss in women: Do women always need to undergo hair transplant for it? Hair loss in men is very common and socially acceptable but hair loss in women is considered very abnormal. Hair loss in women at a young age is a very traumatic experience. Hair loss in women has a negative effect on their social life and might lead to low self-esteem and depression. The female pattern of hair loss tends to be more diffuse, with less likelihood of the crown and frontal hairline being lost. Hair loss in women can start as early as in their 20s but the pace of hair loss tends to be gradual, often taking years to become obvious. Fortunately, hair loss in women typically does not result in complete baldness. And hence few women undergo hair transplant as compared to men. Medicines and PRP Therapy are more effective in treating diffuse hair loss in women, as compared to hair transplant. In this hair starts thinning from the top of the head. This is the most common cause in women. This kind of baldness is usually less diagnosed in women and is usually genetic in nature. There is most supporting the use of minoxidil medicine as a safe and effective treatment for the female of hair loss, and there is no scientific difference between 2% and 5% formulations. Finasteride medicine was shown to be no more effective. The effectiveness of laser-based and other therapies is unclear. what you do: If you can’t use birth control pills, your doctor may prescribe spironolactone, which also blocks male hormones. Losing weight can also help by decreasing the effect of male hormones. If the human body makes too much of the hormone, So we said to have hypothyroidism. Hypothyroidism leads to reduced basal metabolic rate which slows down the growth of hair and can lead to hair loss of hair in the long run. So, do hair loss treatment as soon as my hair transplant in Delhi. This leads to reduced hair density and diffuse of hair loss. Correction of the cause leads to the revival of the hair loss treatment do by hair transplant in Delhi. When in the human body don’t have the right amount so there have so many issues in hair loss. So, may notice changes in body functions. Telogen effluvium is a sudden hair loss of hair loss treatment which occurs after pregnancy, major surgery, drastic weight loss, or extreme stress. The symptoms of telogen effluvium Women notice hair loss 6 weeks to 3 months after a stressful event. At its peak, you may lose of hair loss. In this situation of pregnancy, the hair is actually thicker during pregnancy you may have to bide your time until the major hair loss problems. owing to hair loss treatment increased circulating estrogens. Because of many hair loss in that time, It can also be caused by various medications such as antidepressants, beta-blockers, and nonsteroidal anti-inflammatory drugs by hair transplant in Delhi. During telogen effluvium, the hair loss treatment shifts faster than normal from its growing phase into the “resting” phase before moving quickly into the telogen, phase. Hair loss treatment for the various form of hair loss. In this time if you are bald so hair loss treatment is to compulsory for good looking and anybody wants to do by hair transplant in Delhi. Lupus is a chronic autoimmune disease in which the body’s immune system attacks healthy tissues. By which many people suffer from hair loss, but now we all have the option of hair loss treatment done by hair transplant in Delhi. This condition affects many people who are suffering now hair loss problems and tends to women to strike during the childbearing years. Experience hair loss which can be mild or it may be more severe leading to patchy areas of hair loss accompanied by a rash over the scalp by hair transplant in Delhi. Symptoms of alopecia areata are small bald patches in the head, alopecia areata most affect in beard and scalp by which person start suffering from hair loss problems. Different area of the body may exist hair loss and regrowth at the same time. this disease may be going on the mission for a time or may be permanent. The area of hair loss is maybe tingled or painful. Causes of Alopecia areata: An Alopecia areata is to be a systemic autoimmune disorder in which the human body attacks its own areata hair follicles and stops hair growth, by which hair loss at a peak point. Also known as dandruff, this is an unhealthy state of scalp commonly due to fungal infection leading to hair loss. Seborrheic Dermatitis cause is unclear but believed us to involve a number of genetic and environmental factors in female hair loss. Some factor includes many poor immune functions, Parkinson disease, epilepsy, and Down syndrome. The condition may worsen with stress or during the winter. It is not a result of poor hygiene, because of poor hygiene female also facing trouble with hair loss problems. Anemia is a decrease in the total amount in the RBC(red blood cell) and hemoglobin in the blood. when anemia comes slowly then the person feels tired, and week also. Deficiency of essential minerals and vitamins in the body can also lead to thinning of hair which over the period of time leads to hair loss. Unrestrained styling of the hair in the hands of an untrained person with excessive shampooing and dry blowing can cause the skin of the scalp to dry and lead to hair loss. Chemical and heat treatments like straightening of hairs can also cause hair loss. This is also known as androgenetic alopecia and this is also an important cause of hair loss. The gene can be inherited from either the mother’s or father’s side of the family. The condition develops slowly and may start as early as in the 20s. Other factors that can also contribute to hair loss are stress, trauma, immune disturbances, hormonal disturbances, infections, improper dieting, any major medical illness, medications, chemical treatment of hairs, etc. Female pattern baldness is usually diagnosed based on ruling out the other causes of hair loss, the appearance and pattern of hair loss and detailed medical history. The signs of hormonal imbalances like abnormal new hair growth, such as on the face or between the belly button and pubic area, changes in menstrual periods and new acne. At times a skin biopsy or other procedures or blood tests may be used to diagnose skin disorders that cause hair loss. Microscopic examination of the hair shaft is also helpful in getting the complete picture. Hereditary hair loss is the most common cause of hair loss. This is also known as androgenetic alopecia and this is also an important cause of hair loss. The gene can be inherited from either the mother’s or father’s side of the family. Because many peoples suffer from baldness, but at this time don’t worry about it. Now hair loss treatment is to be easy to do by hair transplant in Delhi. 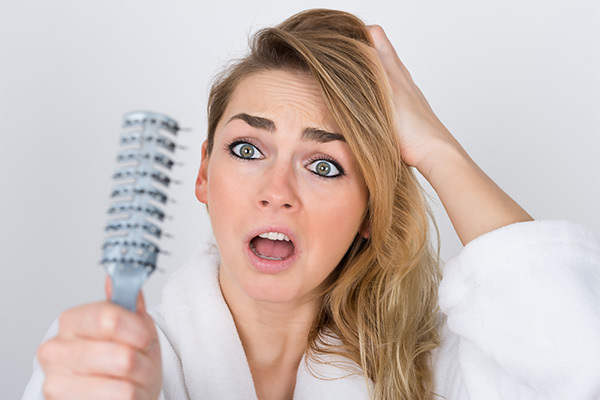 Symptoms of Hereditary hair loss in women. Women trait tend with her heredity because some parents are bald by which the women develop thinning at the hairline behind the bangs. this condition slowly and maybe starts at the age of 20. You maybe same if your mother also has the same pattern of thinning hairs and also hair loss problems. So the hair loss may be spread on the across the scalp. In female pattern baldness, the thinning of hair is mainly on the top and crown of the scalp. It usually starts widening from this central part. The frontal hairline remains unaffected except for normal recession, which happens due to aging. The hair loss in women rarely progresses to total or near total baldness. In most cases, hair loss in females is mild to moderate. Treatment is only needed if the patient is not comfortable with her appearance. Hair transplant is less commonly done in cases of female hair loss. The only hair loss medication which has been approved by the United States Food and Drug Administration (FDA) to treat female pattern hair loss is minoxidil. It is used in 2% concentration and applied directly over the bald area of the scalp. In most cases, this slows down or stops the hair fall and prevents hair transplant. Minoxidil, the application is to be continued as hair loss starts once again when it is stopped. If minoxidil does not prevent hair loss then some second-line medications like spironolactone, cimetidine, birth control pills, and ketoconazole can be started to prevent undergoing hair transplant procedure. But these medicines should be taken only under the guidance of a physician with full knowledge of their side effects. Platelet rich plasma therapy also referred to as PRP Therapy is a very effective modality for management of hair loss or alopecia in women. In this therapy platelets with all the growth factors are directly injected into the scalp near the root of hairs. The growth factors released by platelets then stimulate the growth of hair follicles. These growth factors also create a positive environment around the dormant hair follicles in the scalp. This PRP Therapy helps dormant hair follicles to sprout back again. This not only makes the remaining hair healthier but also leads to the growth of new hair from the scalp. The PRP injections are given under the nerve block and are to be repeated every four weeks. On an average four sessions of PRP are required to get appreciable growth of new hairs. 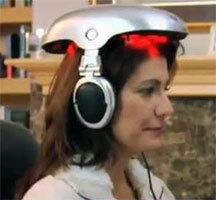 This is the newest non-invasive modality for treatment of hair loss. Laser therapy for hair loss is US FDA approved and especially suited for females as other medications are less effective in females. The low energy laser light stimulates the growth of existing hair follicles leading to an increased volume of hair. The dormant hair follicles are also stimulated and they give rise to new hair over the scalp. Overall within few months, the scalp hair is healthier, longer, voluminous and more in numbers. Called by various fancy names it a simple and effective procedure where the micro-environment around the hair follicles is made conducive for the growth of existing hair follicles and germination of the dormant hair follicles. 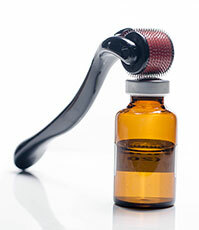 In these techniques, essential nutrients and various growth factors are supplied to the hair follicles by multiple injections or by making multiple pores in the scalp using dermaroller. Unique names and big fancy machines are used for this simple procedure for commercial reasons. Hair transplant is a viable, permanent and least expensive option to manage female baldness in long run. In hair transplant, hair grafts are taken from the back of the scalp and individual hair follicles are transplanted over the bald areas. Follicle unit extraction technique is a little more difficult to execute in females as compared to male. The donor site heals well and the hair follicles grow over the recipient area and in few months time, all the bald area gets covered by new hair. Hair loss due to mechanical pulling of hair or traction alopecia especially due to some hairstyles or tight application of hair band or clips. Women having hair loss similar to that of male pattern baldness. Women who have suffered hair loss due to trauma, including burn victims, accidents, and chemical burns. Hair weaving, hair growth fiber or a change in hairstyle can improve appearance. Only a change in hairstyle can be recommended to the patients. All other things have their own drawbacks and side effects and these can fail at a wrong occasion leaving your social image shattered.